Two elderly women were out driving in a large car-both could barely see over the dashboard. As they were cruising along they came to an intersection. The woman in the passenger seat thought to herself "I must be losing it, I could have sworn we just went through a red light." After a few more minutes they came to another intersection and the light was red again and again they went right though. 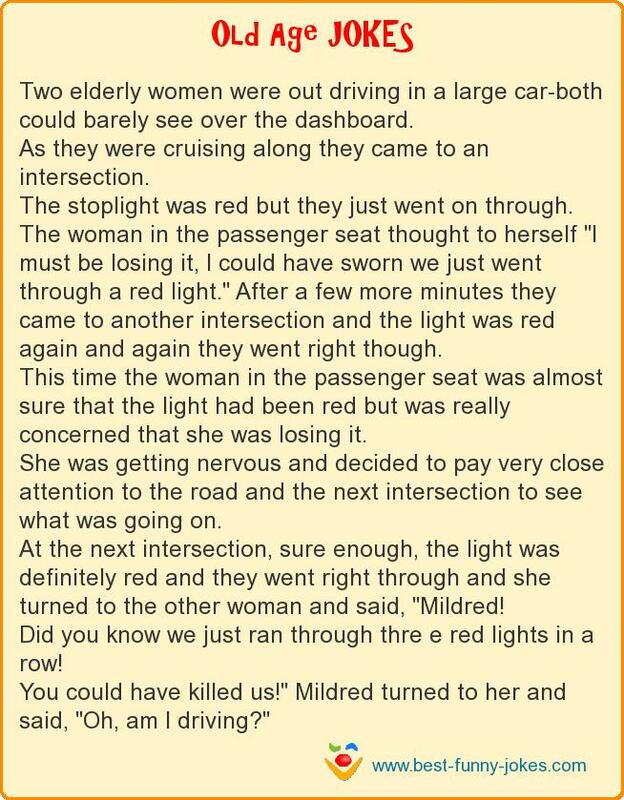 At the next intersection, sure enough, the light was definitely red and they went right through and she turned to the other woman and said, "Mildred! Did you know we just ran through thre e red lights in a row! You could have killed us!" Mildred turned to her and said, "Oh, am I driving?"